Postcard US-3118723 to Hong Kong was a 1960 vintage linen postcard showing Lord Baltimore Hotel in Baltimore, Maryland. 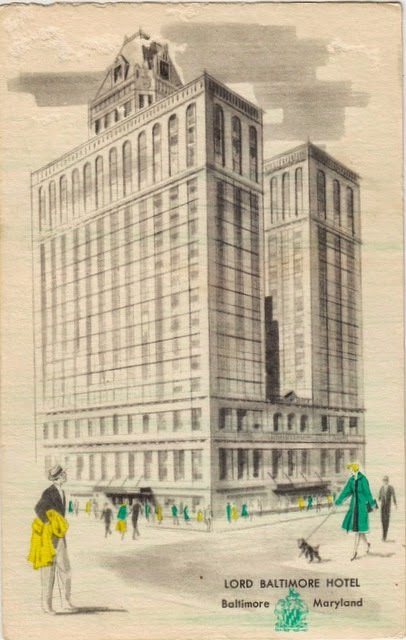 Designed by William Lee Stoddart in the French Renaissance style, the 22-story 289-feet or 88-meter tall hotel opened on December 30, 1928. The hotel has a brick veneer over a steel frame and a tower featuring a mansard roof of copper on the top. The Lord Baltimore Hotel was noted for its voluntary ending of its restrictive guest policies in 1958 after the Baltimore City Council's failed attempt to pass an ordinance prohibiting racial segregation in public accommodations. The original Lord Baltimore Hotel closed in 1982, and re-opened in 2014 as an independent hotel after a series of ownership changes. The hotel was listed on the National Register of Historic Places in 1982. Under the current ownership of Rubell Hotels of Miami, Florida, it had undergone a total renovation of guest rooms and restoration of the building's public spaces.